If you are a senior adult with diabetes, your life is not over. Yes, it is a challenge, but there are ways to manage it and many health care professionals who will help you learn how. Also, you may have family and friends you can call on to support you. Let’s take a look at some of the basics. The best place to begin is with your physician. 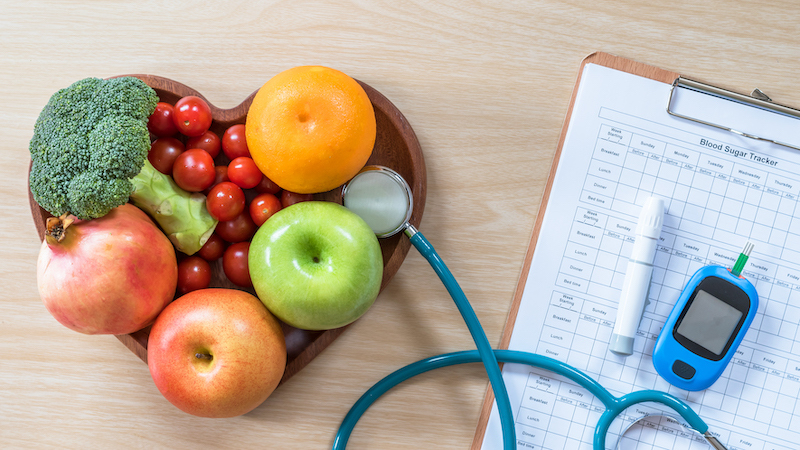 According to Lindsay Johnson, RD, LD, the Clinical Dietitian at Barnes-Jewish Extended Care, your primary care physician can make you aware of the major health risks of diabetes, prescribe your medication, and help you manage the disease. She or he can steer you in the direction of specialists as well. A certified diabetes educator can make managing your diabetes easier by working with you to develop a customized eating plan, suggesting appropriate exercises, and monitoring your medications so that they are working along with your diet and exercise. For example, they can determine how many grams of carbohydrates you should consume based on your size, activity level, and the medications you are taking (types and amounts of carbohydrates are important for managing diabetes). Caregivers and family would also benefit from meeting with the diabetes educator while you are there. A glucometer tests diabetes on a daily basis and a test called an A1C taken every three to four months indicates how well you have controlled your blood sugar levels. Seniors who are managing their diabetes effectively commit themselves to checking glucose levels in both the short and long term. As another resource on diet, Lindsay suggests MyPlate. “It’s simple to use, has good visuals, recipes, and resources for more specific information,” she says. Eating a diet lower in carbohydrates, which includes lean protein and avoids foods like white rice and pasta, is recommended, especially if it is not whole grain (whole grains release sugar more slowly into the blood stream). Breakfast: 1 pat of butter on 1 piece of whole grain toast or 4 thin slices avocado. Lunch: Olive oil and vinegar dressing on a side salad and a slice of low-fat cheese on a half-sandwich. Dinner and Snack: Cook something with a little canola oil for dinner. Add a small handful of mixed nuts (1/4 cup) with a small piece of fresh fruit. Research shows including a little fat at each meal can prevent you from overeating later in the day or having the urge to have a large dessert after dinner. As your knowledge and experience increases, the details of managing diabetes will become less overwhelming. Food options, exercise programs, and support resources are available to provide a variety of ways to control it. The complications from diabetes are serious, including heart problems, kidney disease, blindness, and loss of limbs due to non-healing wounds. Learning the signs of serious complications is vital. In particular, cuts or sores on the foot can quickly become an infected non-healing wound that may result in amputation, which makes foot inspections and care extremely important. A condition called diabetic neuropathy, which is the loss of sensation in the extremities, may further complicate detecting wounds or sores on the feet. Also, it is important to know the signs of hypoglycemia (low blood glucose levels). “Everyone who has diabetes should know the symptoms of low blood sugar,” Lindsay says. They include sweating, fatigue, dizziness, paleness, and blurred vision, and can result in loss of consciousness or even a coma. Glucose tablets or snacks (Lindsay suggests foods with 15 grams of carbohydrates) should be taken and glucose levels monitored every 15 minutes until they return to normal. Diabetes affects seniors differently than younger people with the disease. According to Lindsay, one problem is that older diabetes patients don’t heal as well as younger patients. Also, seniors may be dealing with multiple illnesses, including high blood pressure, heart disease, kidney disease, high cholesterol, and cognitive problems, and taking multiple medications to treat them. They may forget to eat or be unable to cook for themselves, neglect exercise, and struggle to understand their medications, so caregivers and home health professionals will have to become more involved as the senior ages. Managing diabetes is not easy, especially for older adults. Lindsay cautions caregivers and other loved ones that seniors with diabetes have to determine for themselves how, or if, they want to manage it. “I tell family members there is a level of readiness the senior has to have to work at keeping it under control,” she says. In doing so, some complications can be prevented or delayed, but it takes a great deal of determination on the part of the senior, support from health care professionals, and the commitment of loved ones to deal with diabetes. Find more senior health and wellness tips on our blog.